Use the Grades tool to check the results of your assessment items. You can see your individual grades and comments, as well as class averages (if your educators choose to show them) and feedback. You can also view your final grade and the grade formula used to evaluate you once your educator releases your grades. You can sign up to receive immediate email notifications when a grade item is released or updated. Select if you want to receive Email notifications for the option Grades - grade item released or Grades - grade item updated. Use the Grades tool on the navbar to check the results of your assessment items. You can see your individual grades, as well as the grade formula used to evaluate you. Depending on how your grades are set up, you might be able to view comments and overall class performance statistics as well. Students can view the grade item exemptions in several locations in Connect. On the My Grades page, exemptions are listed in the Grade column. Points and weights that appear on the Grades page are controlled by educators; however, the Grade column always shows exempted grade items. Rubrics can be used to assess your achievement on assignments in your unit, based on predefined achievement levels and assessment criteria. They help ensure that activities are evaluated fairly and consistently, and enable you to view the grading criteria in advance of submitting assignments. Rubrics are associated directly with Assignment submission folders, so you can view the criteria used to assess your assignment when you submit your work. Your educator can enter personalized feedback for you on the rubric, which will appear to you in the feedback area of the folder. 1) You can filter class participants based on membership in groups or sections. 2) Use the Class Progress navbar to sort the order in which users appear in the chart. 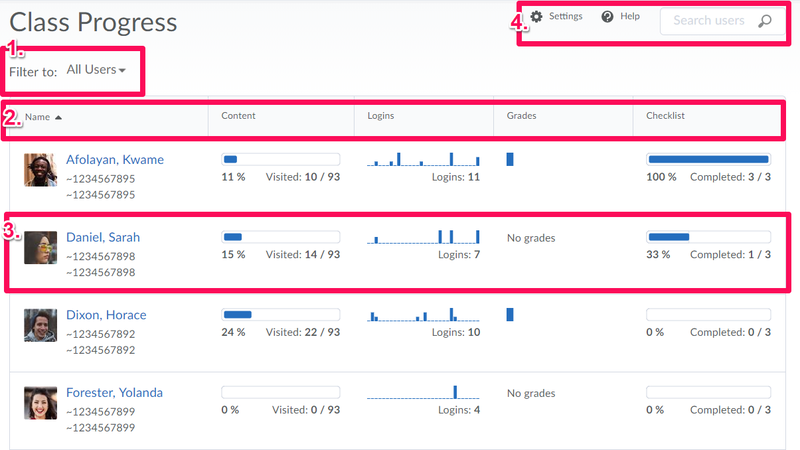 By default, the following performance indicators appear from left to right in the navbar: Content, Objectives, Logins, and Grades. A maximum of 4 progress indicators can display at any time on the Class Progress page. 3) All unit participants appear in the chart. Their name, username, and Org Defined ID display alongside their profile picture, if supplied. Their performance results for the listed indicators also display in the chart. Clicking on any area of this chart brings you to the individual user's User Progress page. 4) Adjust which performance indicators display by default using Settings. You can also search for users in this area. The Class Progress tool helps track your progress in a unit by measuring the completion of 9 different progress indicators. Educators can use the Class Progress tool to track your overall progress in the unit and prepare progress reports. Self assessments are a series of questions, similar to quizzes, that provide the opportunity to reflect on your learning and unit material comprehension. Responses to self assessments are not graded; they are meant to help your educator evaluate student learning and their unit material on an informal basis. Access self assessment activities from the Content tool. If they have been configured in your unit, they’ll be available in the sequence of your learning materials. Why can't I change or delete a self assessment? If you need to make a change to your self assessment response, contact your unit educator.